The village takes its name (translatable into English as "below the rock") from an inselberg called the "Devil's Rock", which is located on an adjacent hill. Pidkamin became known for a Dominican monastery. It was established by twelve monks from a monastery established by Saint Hyacinth in Kyiv who were forced to flee from the city when it was ravaged by Mongols (in 1240). Prior Urban and 12 monks were martyred by Tatars in 1245. In the second half of the 15th century wasteland around the place where the monastery had been, was in possession of nobleman Petrus Cebrovscii who founded the town. With his assistance on the mountain was built a castle, rebuilt Roman Catholic church. Knowing the stories about being here before the Dominican monastery, he went to Lviv archbishop asking that he sent to Pidkamin monks. 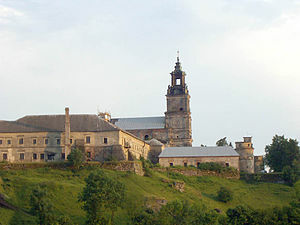 Monastery was reestablished in 1464 by the Latin Archbishop of Lviv Gregory of Sanok, who himself came to the feast of the Assumption of the Virgin Mary monks came to the Roman church of the Assumption of the Virgin Mary, St Cross, Peter and Paul and all the saints. In the 17th century a fortified abbey was constructed. Pidkamin hosted a miraculous icon of the Blessed Virgin Mary (a copy of the famous Protectress of the Roman People from the Santa Maria Maggiore Basilica in Rome), crowned in 1727 by the Latin Rite bishop of Lutsk Stefan Rupniewski, assisted by other Roman Catholic and Greek Catholic bishops, with a crown conferred by Pope Benedict XIII. After the region came under Austrian rule in 1772 the monastery suffered from the policies of Emperor Joseph II, and although saved by the emperor's death, it never regained its former significance. In 1915, Pidkamin was largely destroyed by Russian artillery. The icon was again crowned in 1927 by the Latin Rite Metropolitan of Lviv Bolesław Twardowski and in 1959 by the Cardinal Primate of Poland Stefan Wyszyński. During the Massacres of Poles in Volhynia, Pidkamin was a shelter for Poles, who escaped there to hide in the monastery. Some 2,000 people, the majority of whom were women and children, were living there when the monastery was attacked in mid-March 1944, by the Ukrainian Insurgent Army, cooperating with the Ukrainian SS. Around 300 Poles were murdered in the monastery, and additional 500 were killed in the town of Pidkamin itself. In the nearby village of Palikrovy, 300 Poles were killed, 20 in Maliniska and 16 in Chernytsia. Armed Ukrainian groups destroyed the monastery, stealing all valuables, except for the monastery's crowned icon. After World War II the icon was removed from Pidkamin to rescue it from communists and today remains in the Dominican church of St Adalbert in Wrocław, Poland. In 1946 the monastery was closed by the Soviets and turned into a jail. Among the inmates was the Blessed Priest and Martyr Nicholas Tsehelskyj. Later the monastery was used as psychiatric hospital, which still exists, and the church was turned into a stable. After the dissolution of the Soviet Union and the emergence of independent Ukraine, the ruins of the monastery were given to Ukrainian Greek Catholic Studite Brethren. From 1940 to 1959 Pidkamin was an administrative center of Pidkamin Raion. Prior to the Second World War Pidkamin had a Jewish population that was tragically murdered during the Holocaust by German Nazis. Leopold Buczkowski (1905–1989), Polish writer, artist. Stefan Aleksander Potocki (buried in Pidkamin), a voivode of Belz (1720-1726), a founder of Basilian monastery in Buchach, father of Mikołaj Bazyli Potocki. Sadok Barącz, Latin Rite religious leader, historian, folklorist, archivist, an Armenian by nationality, the prior of Dominican Monastery. Wikimedia Commons has media related to Pidkamin. This page was last edited on 17 February 2019, at 18:49 (UTC).